Our Constitution contains very few rights. But one of them is understood to be a right to a trial by jury. This week we take a closer look at the history of trial by jury and what the Australian Constitution says. It is within the powers of the Parliament to say what shall be an indictable offence and what shall not. The Parliament could, if it chose, say that murder was not an indictable offence, and therefore the right to try a person accused of murder would not necessarily be by jury. Another Victorian delegate, H.B. Higgins was also actively involved in the debates about section 80 of the Constitution and suggested that ‘the question of a trial by jury might safely be left to the Federal Parliament’. Others at the conventions saw this section of the Constitution as a ‘safeguard of individual liberties’. While Isaacs continued to argue that any guarantee of liberty ‘might be evaded by a technicality’ and even after some discussion about changing the wording he suggested that ‘the clause, in either form, would have little real effect’. As you can see he was not a fan of this section of the Constitution as it was written. In 1894 Isaac Isaacs was the Attorney-General of Victoria and in March 1897 he was elected to the Federation Convention for Victoria (the Constitutional Conventions). He was then elected in the first federal Parliament as a Protectionist in 1901 and became Attorney-General in 1905. He left this position a year later when he was appointed to the High Court. He later went on to become our third Chief Justice and in 1931 he was appointed as our first Australian born Governor-General. Higgins also went on to sit as a Justice of the High Court. In the Australian colonies before federation indictable offences were prosecuted in the name of the Attorney-General by a process known as ‘information, presentment, or indictment’. This meant that the indictment was made by a law officer (the Attorney-General) rather than by a grand jury. In other countries around the world, including the US, a grand jury decided whether to indict someone for trial (the US system still works this way). The Constitution is an Imperial Statute, and both it and the laws of the Parliament made under it are the law of the land. Accordingly the wilful doing of any act expressly prohibited by the Constitution or laws, even though not declared punishable, is a misdemeanour…. Accordingly the provision that “each elector shall vote only once” is an express provision against plural voting, and any elector voting more than once at a federal election will be guilty of a misdemeanour. If you vote more than once in an election, you commit a misdemeanour and will be given a fine. Many believe that the right to a trial by jury was sourced from the Magna Carta in 1215. However, ideas don’t normally come from nothing. Little bits of ideas build on others until a new system is created. 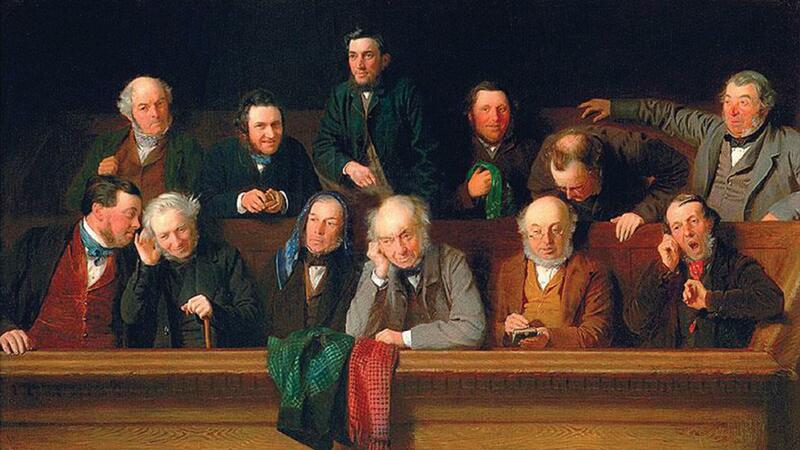 In this case the seed of the idea of juries may have come from the French. The reason why this section of the Magna Carta was so important is that it was an essential function to guarantee the protection of citizens (probably just the barons in 1215) against the use of arbitrary power by the King. By the fourteenth century it was common practice to have a jury of twelve laypersons to judge whether someone was guilty of a crime, even if the crime was not serious. In fact, there was normally a grand jury that took on the inquisitorial role to decide if a trial should go ahead and then another jury that decided guilt or not at the trial. Later in the fourteenth century, as the populations grew, so did the volume of cases in the courts. It became impossible to have a jury trial for all offences. As such the practice was pared back and King Henry VII allowed justices to hear and determine all offences and contempts apart from ‘felonies’. As such petty crimes such as swearing, embezzlement and public drunkenness were determined by a judge. We might now call these petty crimes summary offences. It has been argued, for many centuries, that there is no underlying principle that identifies whether an offence should be heard by a judge alone or a jury. The situation above of embezzlement being able to be heard by a judge alone is a good example of this. Many would say this is a very serious crime and should be heard by a jury. Perhaps the problem of having no underlying principle in regards to what is an indictable crime was what concerned Isaac Isaacs when the Constitution was being written. It is left up to the Parliament to decide whether an offence is indictable or not is. What about serious crimes and wrong doings? The High Court has been asked to determine what is or is not an indictable offence on many occasions. While there have been some dissents, the Court has maintained that an offence is only indictable when the Parliament stipulates that it is. This is what is called a narrow or orthodox view of the Constitution. Even some serious offences may be summary offences if the legislation makes it so. A judge on their own decides guilt or innocence for summary offences. The defendants were entitled to have the question of their guilt or innocence determined by a jury on a trial on indictment, and were wrongly and unlawfully denied such trial by the police magistrate. The appeal was dismissed and it was found that an offence was only indictable if the legislation so indicated. Before we start to criticise the Constitution we should look back over why juries were so important when they were established. They were a way of protecting the barons from the tyranny of the King (mostly with tax or land disputes). The English Parliament was also set up as a protector of the people from the King. As such the legislative branch of Government in Australia (our House of Representatives and the Senate) is there as one of the checks and balances on the executive branch (what we call the Government). While the Government normally writes and introduces legislation to the Parliament that stipulates which crimes are indictable or not, the Legislature (essentially the Senate) has the power to amend it or refuse to pass it. The third branch of government in Australia is the judiciary, who provide the checks and balance on the legislature and executive. So, while they have taken a narrow view of section 80 in the past, it does not mean that they will continue to do this in all cases. Some commentators have argued that if the Parliament were to use its power arbitrarily then Court may make a new determination on the limits of this power. While others argue that we shouldn’t even have trials by jury in the modern age.